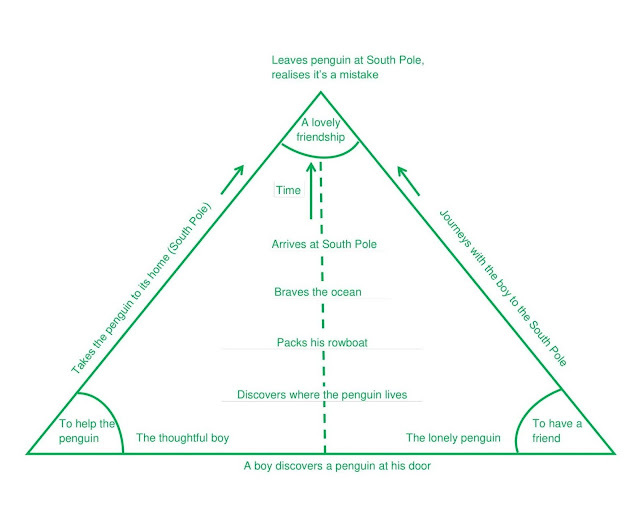 Paul’s Story Trigonometry is a useful way of visualising the central conflict in a story. 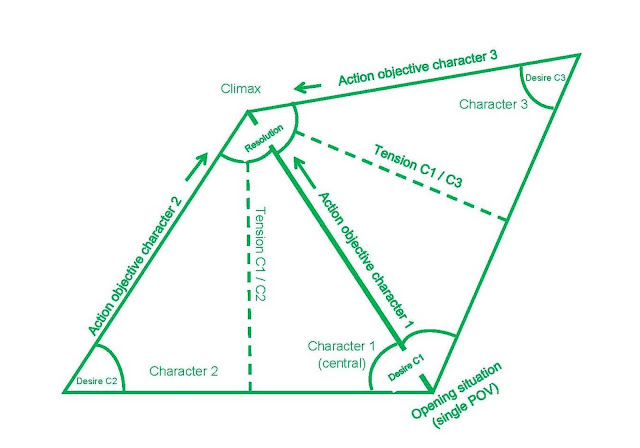 By using such a model, you can gain critical insight into your story: Have you identified the central conflict? Do you understand the main characters’ desires and resulting actions? 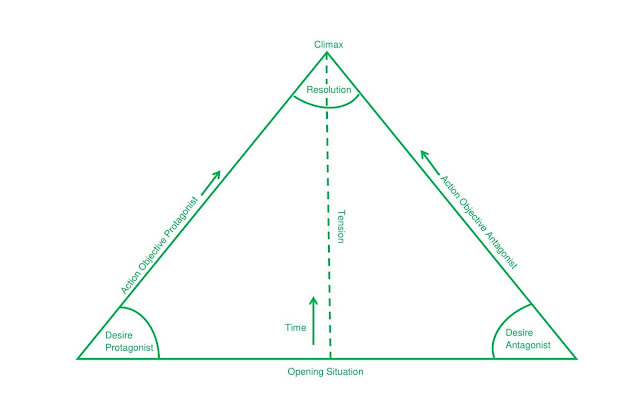 Do these opposing courses of action collide (climax)? And is the story resolution integral to the conflict (not incidental)? Desire: Three human desires: to have, to become, to be freed from. Model 1 Example: Lost and Found by Oliver Jeffers. As seen from the model above, the conflict in this story comes about through a humorous misunderstanding; and the climax is a revelation for the boy (who is a little lonely too). See also how the resolution is integral to the story: loneliness is resolved for both the boy and penguin, and a beautiful friendship blossoms. The above model shows a central character with two other main characters. From the above example, the relationship between the main characters, their desires and “action objectives” are clear. The story tension arises (in part) through conflict (Matilda / Trunchbull) and the mystery behind Miss Honey and the unfolding friendship (Matilda / Miss Honey). The model could be expanded to include other characters such as Matilda’s parents. By sketching out the central story conflict early in your writing, you can readily discover or gain a strong sense of the story outcome. 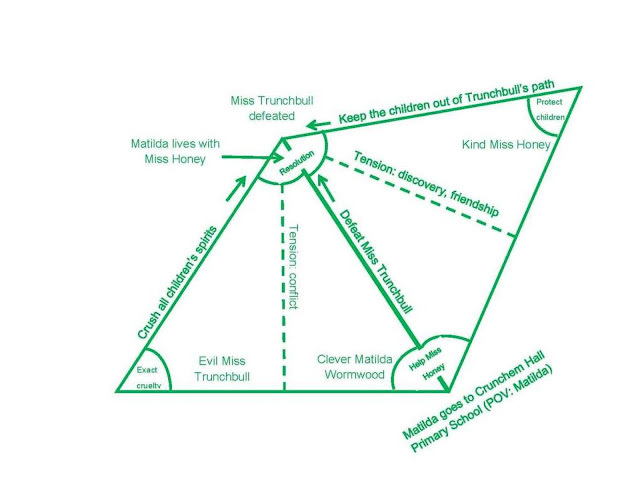 You may not know the details of this outcome (How exactly does Matilda and Miss Honey defeat Miss Trunchbull? ), but with the general outcome in mind (Miss Trunchbull is defeated, Matilda lives with Miss Honey), you can write towards it, enjoying all the discoveries along the way.